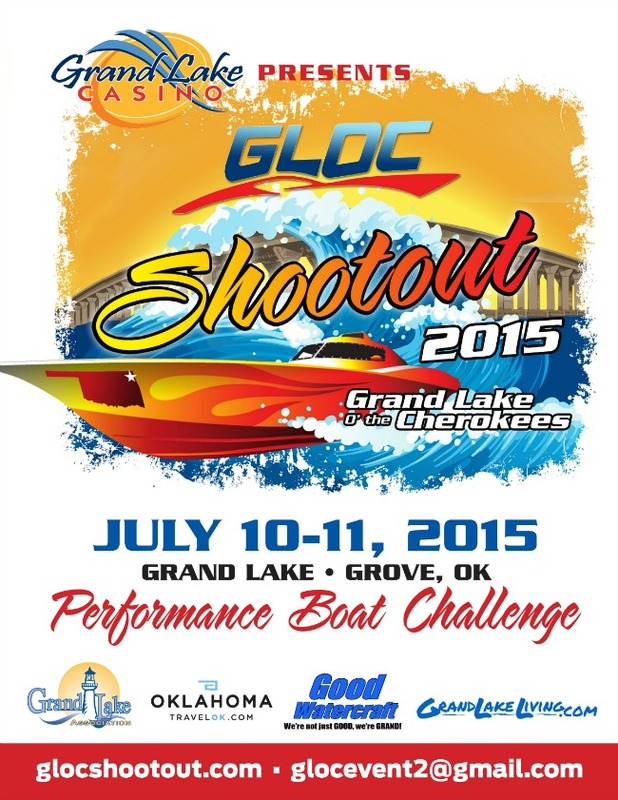 Some may call it a need for speed, but for Ken and Linda Little of Grove, Oklahoma, they call it the very first GLOC Shootout High Performance Boat Challenge to ever take place on Grand Lake. While this type of high speed racing is old hat to the folks at Lake of the Ozarks, it’s something new for Oklahoma and the buzz is growing. Over sixty high performance boats ranging in size, make, model and shape will converge on the north end of Grand Lake on July 10th and 11th to race against the radar gun. The boats, reaching speeds of nearly 200 miles per hour within seconds, will start at Sailboat Bridge and travel a course approved by the Grand River Dam Authority that stretches three fourths of a mile. The name of the game is to see who can run the fastest time within two passes. Bringing the event to Grand was thought up by Ken and Linda Little who have raced boats for the majority of their lives in different areas of the country. Mayor Marty Follis of Grove and Angela Good of Good Watercraft have been two of the biggest supporters of the event, having seen these races at Lake of the Ozarks. The Little’s got into the world of racing at the urge of their son, Shaun. Most of the races of this type take place off of the coast of Florida. While there are only four races like this that take place in the United States, Grand Lake is excited to test the waters on this style of racing. Racers from all over the country, including some from Canada, will converge during the event. Spectators from as far as Italy are expected to line the shores to watch. Crowds are expected to gather in front of Grand Lakeside, formerly Royal Bay Marina, as well as line the course to take in the action. The event kicks off at the Grove Civic Center on Friday, July 10 with a fun filled day of racers meeting with the public and giving them an up close and personal look at the boats themselves. There will be giveaways, shopping vendors, marine vendors, food throughout the day and live music. All proceeds will go to support local charities around the area. A boat parade will run from the Grove Civic Center to Wolf Creek Park on Saturday morning where the boats will launch and head for the racing start point at Sailboat Bridge. The high dollar boats will reach high rates of speed within a matter of seconds. These boats are made specifically for racing; and with not very many chances to race them – makes this race spark interest from racers and spectators from around the globe. Grand Lake feels lucky to be able to host the event and to have the support of numerous local businesses who hope it turns into an annual event to promote the awesomeness which is Grand Lake O’ The Cherokees. For more information visit www.glocshootout.com or email [email protected]. Guest post written and submitted by Mary Pryor.